Gujarati aloo matar recipe – This is made without onion garlic. 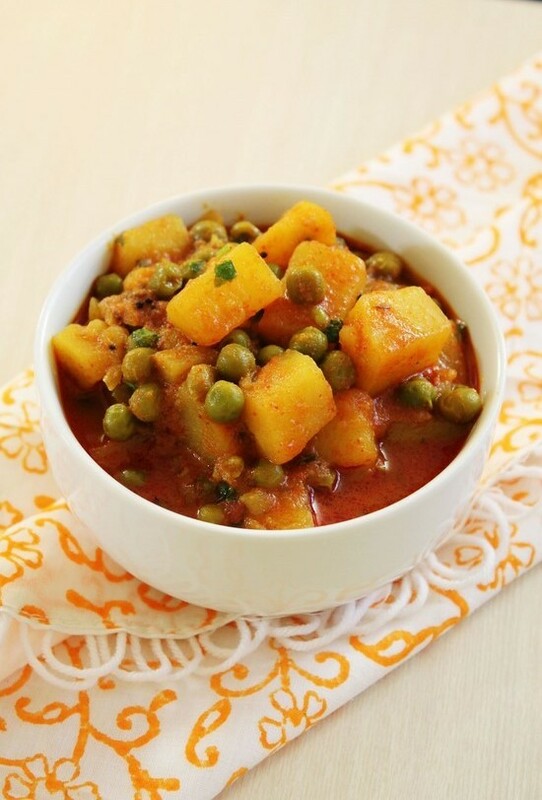 In Gujarati language, it is called vatana batata nu shaak where vatana mean peas and batata means potato. When you are out of vegetables in the fridge, this recipe will come very handy to you. As potatoes and tomatoes are always present in Indian pantry. I assume you have frozen peas handy. Spices are used in this curry is very basic. All the versions have different kind of gravy, but this one does not require grinding and making gravy process. Gravy will come together as you cook potatoes, peas and tomatoes into water with spices. Thus it is quick to make, throw in all the ingredients in a pan, cover and let them cook. Yes just that simple. 1) Let’s start with preparing potato, peas and tomatoes. Do not chop the tomatoes finely, keep them into medium chunks. 2) Then make paste from ginger and green chilies. I have used mortar and pestle. But instead you can grate the ginger and finely chop the chili. 3) Heat the oil in a pan on medium heat. Once hot add mustard seeds and let them pop. Then add cumin seeds and let them sizzle. 4) Then sauté ginger-chili paste for few seconds or till the raw smell of ginger goes away. 5) Add potatoes and peas. 6) Mix well, so oil is coated well. 7) Add all dry spices (turmeric powder, chili powder, cumin powder and coriander powder) with salt. 8) Mix well, so spices are also coated well. 11) Add water and cover the pan. 13) Lastly add cilantro and turn off the stove. 14) Mix it and keep the pan covered for 5 minutes and let it rest. Believe me this 5 minutes is totally worth to wait, this will help the gravy to become thick. When you turn off the stove gravy looks watery and separated from potatoes and peas, but within 5 minutes resting (covered) time, magic will happen and gravy will looks that it comes together. 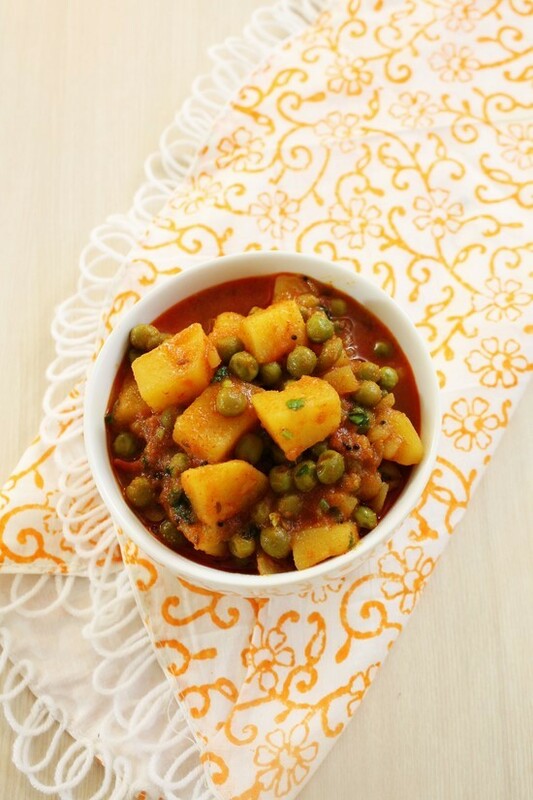 Serving suggestion: Serve this curry with phulka roti or pratha. It can be served with plain steamed rice. Wash and scrub the potato well. Peel it and cut into cubes. Also chop the tomatoes. make sure to keep into big chunks not finely chopped. Then make paste from ginger and green chilies. I have used mortar and pestle. But instead you can grate the ginger and finely chop the chili. Then sauté ginger-chili paste for few seconds. Add potatoes and peas. Mix well, so oil is coated well. Add all dry spices with salt. Mix well, so spices are also coated well. Add chopped tomatoes. Stir them in. Lastly add cilantro and turn off the stove. Wow that’s hot. I removed the green chili and reduced the chili powder and it was still too hot for my partner. Will try again, but make a few changes. You can adjust the chilies as per your desire taste. Hope it comes out as per your liking next time. Hi, I was looking for a Gujarati recipe and found yours but you say “aloo” and that is not a Gujrati term. Is this recipe Gujarati then? Also, how many people does this amount feed. Yes this is Gujarati recipe. I have used the common language that everyone can understand. In the description, I have translated the Gujarati name of the dish. As mentioned in the recipe, this makes 2 servings meaning for 2 people as a meal with paratha or roti.